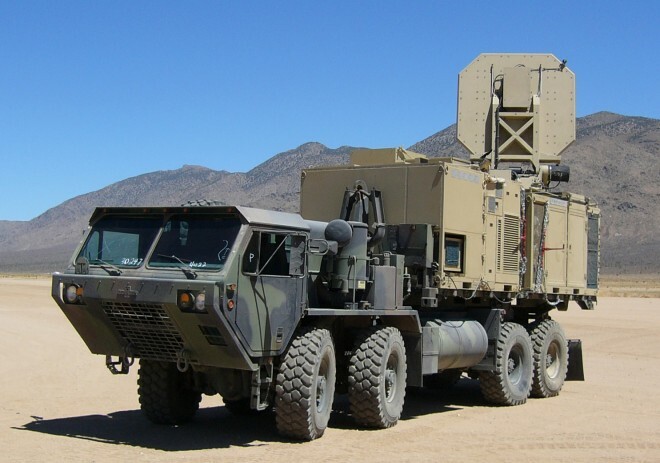 The "Active Denial System" yesterday was reportedly being used on Afghanistan. The U.S. mission in Afghanistan centers around swaying locals to its side. And there’s no better persuasion tool than an invisible pain ray that makes people feel like they’re on fire. OK, OK. Maybe that isn’t precisely the logic being employed those segments of the American military who would like to deploy the Active Denial System to Afghanistan. I’m sure they’re telling themselves that the generally non-lethal microwave weapon is a better, safer crowd control alternative than an M-16. But those ray-gun advocates better think long and hard about the Taliban’s propaganda bonanza when news leaks of the Americans zapping Afghans until they feel roasted alive. An Air Force military officer and a civilian employee at the Air Force Research Laboratory are just two of the people telling our pal Sharon Weinberger that the vehicle-mounted “block 2″ version of the pain ray is in the warzone, but hasn’t been used in combat. Update: “We are currently not testing the Active Denial System in Afghanistan,” Kelley Hughes, spokesperson for the Joint Non-Lethal Weapons Directorate, tells Danger Room. So I ask her: Has it been tested previously? She hems and haws. “I’m not gonna get into operational,” Hughes answers. Hughes also disputes the assertion that Active Denial creates a burning feeling. “It’s an intolerable heating sensation,” she says. Jeez what better way for the USA to get hold of all that lithium without firing a shot ! Is this related to spontaneous combustion?